Hollington United Football Club’s first team is bidding to reach a cup final for the second time in a fortnight. 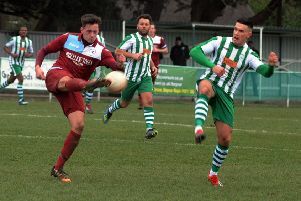 Having booked their place in the Sussex Intermediate Challenge Cup decider earlier this month, the Lions are now aiming to make it through to the Mid Sussex Senior Charity Cup final. Hollington will visit Lindfield in the semi-finals tomorrow (Saturday, kick-off 1.30pm) for the right to play Charlwood or Copthorne in the final. After being without a fixture last weekend, Hollington have dropped to third in the Mid Sussex League Premier Division table, although the top three teams are level on points. Hollington have played a game less than leaders Balcombe and one more than second-placed Cuckfield Rangers. Lindfield are 10 points adrift of the leading trio in fourth. Hollington manager Scott Price said: “It’s the start of a run of games against the other three teams that make up the top four (excluding ourselves). “A tough trip to Lindfield for another away game in another semi-final, which is incidentally our sixth semi-final in under three years since we’ve been at the club. Hollington’s next home game is against Cuckfield on Saturday April 6.